A fruity, juicy and delicious Blood Orange Cocktail made with gin, fresh blood oranges and garnished with thyme. This cocktail is the perfect way to celebrate winter citrus fruits because we should ok, we should drink cocktails! If you happen to like a tipple or two then you’ve got to try this Blood Orange Cocktail. It looks a lot like an Aperol Spritz but tastes nothing like it. This cocktail is all of the juicy, fruitiness and has no bitterness whatsoever. 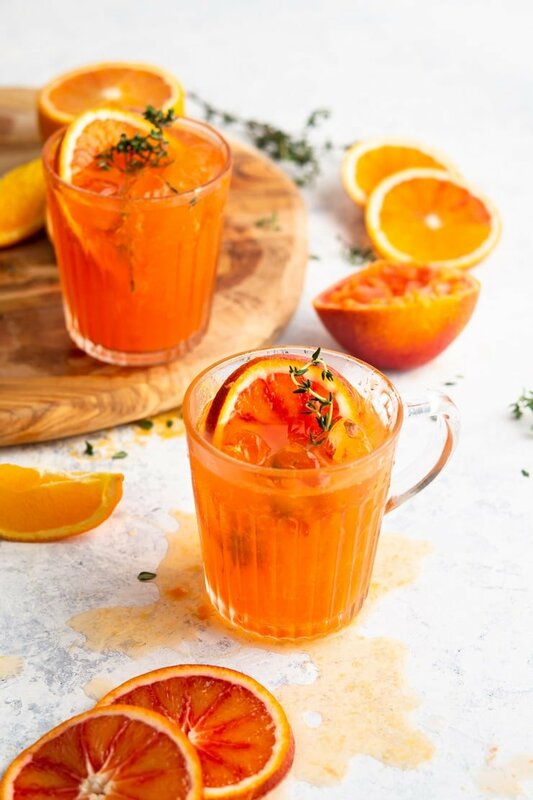 I LOVE blood oranges, not only do they look insanely beautiful but they taste delicious and are packed full of vitamin C….YES, this cocktail is one of your 5 a day….you are so very welcome! Although I am a huge cocktail fan I don’t make them at home unless they are super simple and require only a few ingredients because let’s face it, they can get pretty expensive. This blood orange cocktail is made with 3 alcoholic drinks, gin, Cointreau and Prosecco (gotta have bubbles). The thing is, you can easily adapt the cocktail and leave one liqueur out altogether. I used blood orange gin which is pretty much sunshine in a bottle but you can use any gin for this. I also used Cointreau which is one of my favourite liqueurs ever. It gives the most delicious intense orange kick and tastes like a dream. You can opt to use just ONE liqueur… choose either just gin or just Cointreau and you will reduce the cost dramatically. If you already have one in your cupboard then score! Tip: If you choose to go with just one then double the measure. I use a half measure of each in this recipe so when using just one use a full measure. First, squeeze the juice from half a blood orange into a jug (photo 1). Add half a shot of blood orange gin and half a shot of Cointreau and mix (photo 2). Pour the mixture over a glass filled with ice and top up with prosecco, garnish with a slice of blood orange and sprig of thyme (photo 4). On that note, the freshly squeezed orange juice makes a difference so don’t substitute orange juice in a carton if possible (unless high quality). Cocktails are a great way to kick start a night whether you’re just relaxing over the weekend or entertaining guests, serve them with some delicious appetizers because drinking on an empty stomach just ain’t advised. 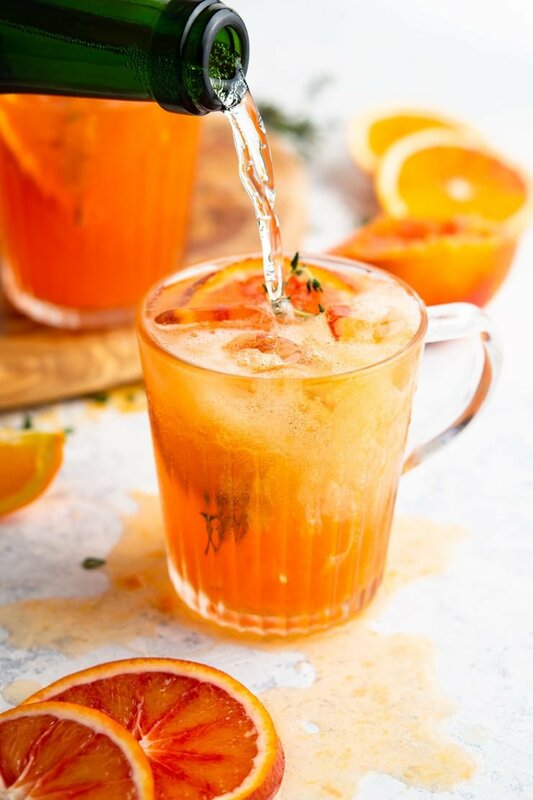 If you’ve tried this Blood Orange Cocktail or any other recipe on the blog then don’t forget to rate the recipe and let me know how you got on in the comments below, I love hearing from you! You can also FOLLOW MEon FACEBOOK, INSTAGRAM and PINTEREST to see more delicious food and what I’m getting up to. 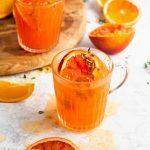 A fruity, juicy and delicious Blood Orange Cocktail made with gin, fresh blood oranges and garnished with thyme. First, squeeze the juice from half a blood orange into a jug. Add half a shot of blood orange gin and half a shot of Cointreau and mix. Pour the mixture over a glass filled with ice and top up with prosecco, garnish with a slice of blood orange and sprig of thyme. On that note, the freshly squeezed orange juice makes a difference so don't substitute orange juice in a carton if possible (unless high quality). Oh my! I just want to pick this up and drink it! It looks so inviting!! Cant wait to try it! That colour is beautiful! Sounds like a great combination with gin. Am gonna include this in the next party that we host! Thanks for sharing! Wow, this looks stunning! 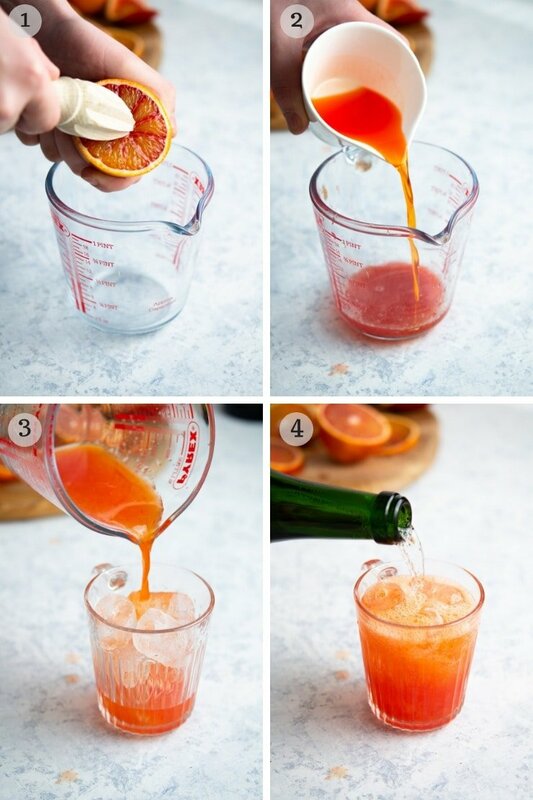 A gorgeous way to make use of blood oranges. Stunning photos too! I love blood oranges. This looks so delicious and refreshing. Thyme sounds amazing with it. that looks so darn refreshing. I guess its about time I tried gin never had it and this cocktail is delightful! Oh really!? I’m not a G&T drinker either but a little splash in a cocktail is so nice! Thanks Claudia.